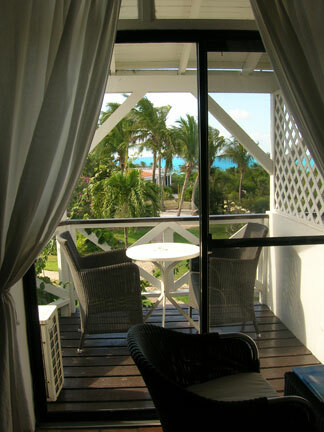 For years the affordable Anguilla accommodation, Anacaona Boutique Hotel in West End Anguilla was known as "La Sirena." We had never stayed at La Sirena. We like to be right on the beach, or near enough to hear the lapping of the waves at night. La Sirena is set back from Meads Bay. When my good friend Kristin Bourne (an Anguilla lover who knows the island well, and who now lives in Anguilla) told me she stayed at Anacaona Boutique Hotel. I was eager to know more about her stay. 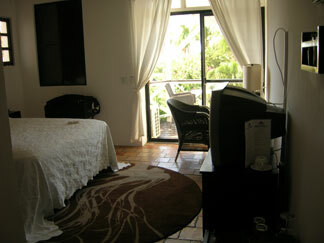 Anacaona Boutique Hotel was reviewed by Kristin Bourne. Comfortable, clean and stylish rooms a 5-minute walk from Meads Bay, Anacaona Boutique Hotel offers affordable accommodations in the high-end West End of Anguilla. The resort features a pool, restaurant, nightly entertainment and beach access. 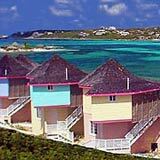 During my visits to Anguilla I always stayed at Rendezvous Bay Hotel. When Rendezvous Bay shut down it was time to look for a new home away from home. I needed a good spot for a single traveler, preferably near the sea. I decided to try Anacaona Boutique Hotel as my next Anguilla accommodation! Why Anacaona Boutique Hotel? Online Anguilla hotel reviews repeated the same thing over and over, good value. And, that's what I was searching for... The lowest price for an 11 day trip near the beach. Anacaona was not going to hurt my budget, it looked nice, and it was within walking distance of Meads Bay. I booked it for late March/early April, as I wanted to be in Anguilla for Moonsplash at Bankie Banx's The Dune Preserve on Rendezvous Bay. Anacaona is set on a hill above Meads Bay in the west end of Anguilla. Upon arrival, I found pretty grounds with fragrant flowers, lush grass, and tall palm trees. The stark-white buildings made a nice contrast with all of the colors, including the terra-cotta roof which I happen to be a big fan of. This Anguilla accommodation was looking good so far! The lobby area is what you might expect. It is covered but open-air, with plenty of seating for arrivals, departures, and if you just wanted to come down and sit and read. They have a computer for use in case you want to check email. The restaurant and pool are also in that same area. I was led to my standard room up one flight of stairs on the 2nd floor. The interior was just like in the website photos complete with the rug with the silhouette of the woman with long, flowing hair... I thought it was cool. There weren't a lot of windows with sweeping views but you could step out on the balcony and take in some scenery. The view from my balcony overlooked the lawn and over the tops of the palm trees, I could see the horizon beyond Meads Bay (not the beach). I could also see more of Anacaona's accommodation, which was a nice view but not extremely private as the building is L-shaped (see the first picture on this page). The nicest time was at sunset because the sun sets just beyond Meads Bay and Anacaona is well situated for that. Upon further investigation I found nice little toiletries on hand. These are great in case you forgot your own, or for a souvenir. There was a small refrigerator which reminded me of the one I had in my dorm room in college. This time, I stocked it with plenty of water, some grapes and gouda cheese of course. There wasn't much else in the way of kitchen supplies, which suited me fine. This was all I needed this trip, as I wasn't planning on cooking. 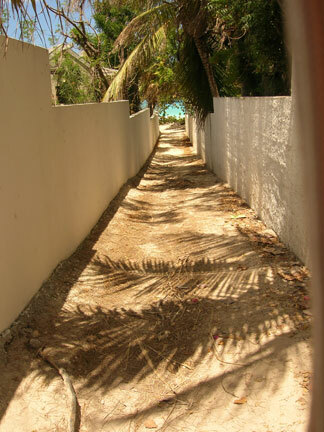 The Last Stretch of Path to The Beach! After settling in, I went out to explore the grounds and figure out how to get down to the beach. The staff at Anacaona pointed me in the right direction. You start out in the lawn in front of the main building which has nice walkways through it and head down past the second and smaller pool. It took me around 5-8 minutes to reach the sand of Meads Bay. Standing on the silky sands of Meads Bay! The Anacaona beach chairs are neighbors to the Viceroy Resort beach chairs as they all sit on the western end of Meads Bay. That end of Meads Bay is beautiful, as is the entire beach (and island for that matter). Meads Bay is wide, relatively flat, and long. It does tend to be rougher compared to other Anguilla beaches. If you like catching a little wave or two, this is a great end of the beach to play in. People interested in surfing in Anguilla, this is the beach to be. The best surfing happens in the Winter. Keep in mind the weather can play a role on the behavior of the waves as well. While not a "baby pool" it is still very manageable and only gets "rougher" come Winter. Yes, Anacaona has a POOL! 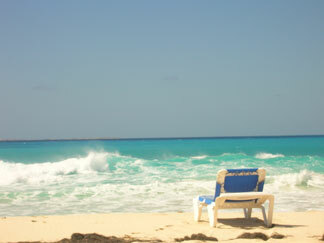 If for some reason the sea is not your cup of tea (hard to imagine that if you are visiting Anguilla!) 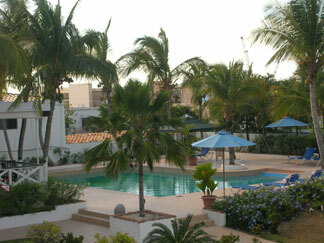 perhaps the pool will be your preferred method of cooling off... Anguilla accommodation includes a pool! Still to this day, I have only been in one pool out of all of the time I've been in Anguilla. I simply prefer the sea and I like to avoid chlorine. I spent plenty of my youth in a pool, so I have nothing against pools, and Anacaona is one of the very few moderately priced hotels in Anguilla that offers a pool. It is a fair-sized, and attractive pool. Update 2017: Firefly is no long open for lunch and dinner (and the Mayoumba Folkloric Theatre has stopped). Firefly is open for breakfast and if you are a guest, breakfast is included in your rate. 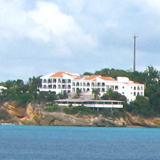 This Anguilla accommodation also has a restaurant on-site. It is set in a lovely open-air scene, which makes me think of Cuba. I can not share personal information about eating at Anacaona's restaurant "Firefly." There are so many tasty Anguilla restaurants that I simply ran out of time. I have heard that it is a substantial improvement to La Sirena's restaurant (which it replaces). Friends from Atlanta chose Anacaona for their Anguilla accommodation and ate at the restaurant several times. They had positive words for the food and mentioned that the restaurant staff was very friendly. The Mayoumba Folkloric Theatre is on my list of things to do! It is a show that uses traditional Anguillian costumes and is about the older days in Anguilla. While you watch the show you eat from an Anguillian Buffet. If you like this sort of thing on your travels, it is an excellent way to try more traditional food, learn about a country's heritage, and be entertained all at the same time. Anacaona uniquely places emphasis on heritage. The name Anacaona is a Taino word meaning "golden flower". This was the name of the only Taino female chief (also known as a "cacique"). Tainos were the pre-Columbian inhabitants of the region. 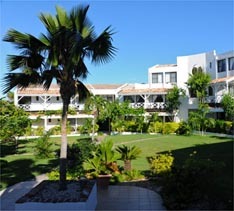 All in all, the Anguilla accommodation provided by Anacaona was pleasant, comfortable and well-priced. 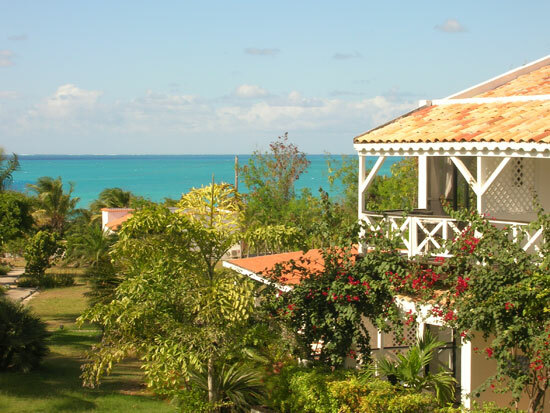 If you are looking for a good value and don't mind not a little bit of a walk to the sea, Anacaona is worth a try. Anacaona Boutique Hotel has undergone extensive improvements... a complete repainting, new roofs, and extensive landscaping, including many lime trees for you to pick and enjoy. In terms of entertainment, a new Monday night "The Night of the Dance" evening features a fixed 3-course dinner while watching Anguilla's Premier Dance Troupe, named "Klassique." You can even learn to Salsa! Price is $55. The popular Thursday night Mayoumba Folkloric Theatre continues to be offered, taking you back to the "old Anguilla" through song and dance ($45). The staff has also undergone training. And new senior staff have been engaged. Expect an improved level of customer care. Together with previous renovations from La Sirena days (Mayoumba, a new restaurant, and room upgrades), Anacaona has completed its makeover into a cultural and wellness focused boutique resort. Click for a review of Anacaona (formerly La Sirena).